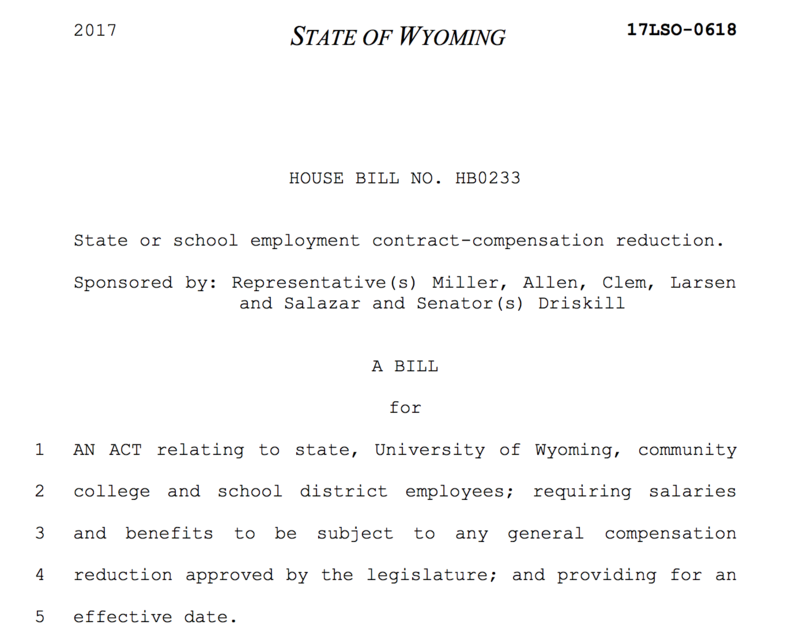 As an assistant professor of instructional technology at the University of Wyoming, Wyoming House Bill 233 directly impacts me and my students. I am an educator of current and future educators. My responsibilities are 65% teaching, 25% research, and 10% service. I *should* be finishing up a manuscript for publication based on a research study I’m conducting on placing preservice teachers in hybrid practical experiences as mentors in an afterschool robotics program. I *should* be finishing up a manuscript for publication based on a research study I conducted about preservice teacher attitudes towards technology after they interviewed practicing teachers about their technology usage. I *should* be grading the first assignment submitted by my undergraduate students in one of three classes I’m teaching this semester. Instead, I’m drafting this public response to Wyoming HB 233. State or school employment contract-compensation reduction. As an educator, I love to talk about my students. What teacher doesn’t? My undergraduate students are education majors or students from other majors, like Chemistry or Mathematics, who seek to enter the alternative certification program we call the “Post-Bacc Program.” Occasionally, I get an undeclared student who’s still trying to decide on a major. The vast majority of my students go on to complete our teacher education program and graduate with a Wyoming teaching licensure, granted by the Wyoming Professional Teaching Standards Board. Some of these students leave Wyoming to seek teaching opportunities in neighboring states; Montana, South Dakota, Nebraska, Colorado, Utah, or Idaho. Many, however, stay here in Wyoming and join the teaching profession in one of our communities. They teach elementary school in Rock Springs. They teach social studies in Cheyenne. They teach math in Gillette. Please contact our Dean’s Office or the UW Alumni Office if you’d like more information about where our teacher candidates are teaching. My graduate students are current K12 teachers and community college faculty. They come to our graduate program in instructional technology to refine their skills as educational leaders and innovators. They seek a master’s or doctoral degree to help secure their position in education and gain the theory and practice behind instructional design, change management, online communication, cognitive psychology, visual literacy, multimedia development. They’re already teaching geography in Rock Springs, mathematics in Casper, K5 in Bondurant, 3rd grade in Gillette, 6th grade in Rock Springs, computer science at Western Wyoming Community College, computer technology at Central Wyoming College and Casper College… the list goes on. Then there are the students enrolled at the Lab School here on campus, in Albany County School District #1. Yes, I even teach them. I teach a design elective every other year in cooperation with the art teacher that pairs our 7th and 8th grade budding designers with undergraduate students taking a course from Family & Consumer Science in Flat Pattern Design. Together, we explore 2D design versus 3D design and scale. We look at cultural inspirations of design. We talk about the integration of math and science within the context of fabric and fashion design. The Lab School students design patterns that we then print on to fabric using high-tech equipment that they see first hand during facilities tours. The undergraduate students work with their young design partners to create garments using these fabrics. Together, we feature the design teams in the end of year fashion show held on campus. If you find yourself in Laramie on April 22, 2017, please join us at the Union to see the works of functional art and science created by these students. We’d love to have you. Now that you know who my students are, let’s explore how this proposed legislation impacts them. The proposed legislation would cut teacher salaries by as much as 20% (EDIT FOR CLARIFICATION: The legislation is open to percentage interpretation. This percentage is based on previously discussed block grant cuts.). Let’s play with a word problem scenario here. A quick online search produces the 2012-2013 Wyoming teacher salary schedule. Since two of the HB233 authors are in Lander, I’ll use the Fremont Co School Dist #1 first year teacher salary at the lowest step. A starting teacher in Lander can expect a salary of at least $43,150 (just barely below the state average of $43,269). If we reduce this by 20%, that means a new teacher would be paid $34,520. If we look at the national salary averages for the same academic year, that puts Wyoming below the national average ($36,141). Wyoming would move from being one of the most teacher-friendly states to paying our teachers less than New Jersey, Alaska, New York, Maryland, Connecticut, Pennsylvania, California, Hawaii, Massachusetts, Delaware, Rhode Island, Louisiana, Texas, Virginia, Illinois, Washington, Alabama, Michigan, Vermont, Nevada, Kentucky, Florida, and Indiana. We would move from being known as one of the few states who truly respects, values, and rewards our teachers to falling among mediocre to low paying states. Moving forward with this bill means that we’ll see more articles and headlines like this one: Teacher Salaries Up 5%, Two Years Into Career Ladder, where Idaho boasts being able to recruit our Wyoming graduates into their state. Remember Gov. Mead’s Wyoming Grown program to try and recruit our young professionals to come home? This bill directly undermines the governor’s efforts. Consider that for a moment. I’ll segue here to share a thought from Dr. Jennifer Geringer, an elementary and early childhood education faculty member at UW and daughter of former governor, the Honorable Jim Geringer. Cut anyone’s salary by 20% and they stop spending. Decline in sales tax revenue. Businesses close. Cities & state further strapped for cash. Can’t compete for high quality educators. Teacher shortage. Decline in quality of education. People leave the state. Loss of revenue. Reduced population means smaller pool of potential employees. Businesses decide not to set up in WY. Further loss of revenue. Lack of job opportunities as students graduate, forces people to relocate. Loss of current AND future revenue. AND don’t even get me started on how inhumane it is to take away the livelihood of the women & men who educate our children. Jenn is my friend, and her words gave me pause. I may not be a native Wyomingite, but it’s quickly become Wy[home]ing for this Texas transplant. Our state has been through a rough year. I’ve watched the southwestern and northeastern corners of our state struggle through the energy industry downturn. I’ve tearfully hugged students who told tales of families losing jobs and considering dropping out of school to go home and try and find work. I’ve watched warily as the UW budget woes hit campus and the rippling effects. My faculty friends and colleagues have received direct and indirect advice to seek appointments at universities in other states. My staff member friends have increasingly looked for positions outside the university and outside the state. My own husband, who works at the UW Power Plant is considering his options. In the past month alone, at least two staffers in key administrative roles have left for jobs in Colorado. We’re already facing zero cost of living or merit pay increases due to the budget. Cutting salaries further will not help retain the faculty and staff we have left. The lowered salaries will not entice anyone to apply and fill these now vacant positions. Enrollment at UW will decline. Houses currently for sale will continue to sit empty as more flood the Laramie real estate market and we all choose the tough decision to move on. The logical conclusion of implementing an across the board state or school employee salary reduction would be, in short, disastrous. To Representatives Miller, Allen, Clem, Larsen and Salazar & Senator Driskill, do you devalue your constituents so much that you’re willing to seek to implement such a drastic and illformed concept? I formally invite you to join my undergraduate students for class one morning and explain to them your intent with this proposal. My class meets every Tuesday/Thursday from 8:10AM to 9:25AM in Education 4. To Rep. Allen & Rep Larsen: One of my direct advisees is an outstanding young man majoring in Secondary Education – Geography and a product of Lander schools. I’m happy to invite him to class on the day you choose to attend so that you can look at him and tell him that his chosen career isn’t worth a quality salary. To Rep. Clem: One of my direct advisees, and figural daughter, is an amazing young woman double majoring in Secondary Education – English and Psychology with Honors. She’s a graduate of Campbell County High School and is currently back home completing her student teaching residency. I’m happy to have her join class on the day you choose to attend via Skype or Google Hangouts so that you can look at her and tell her that she won’t be making as much as she thought she would when she graduates in May. To Rep. Salazar: It just so happens that I have a young man in my class this semester who is from Dubois. While it would pain me to see him drop my class so early in the semester and miss out on his invaluable contribution, you should be the one to tell him now that it’s probably best that he change his major before he takes too many classes. Your collective message in HB233 to current and future educators is clear. You do not value our contribution to the state, to our youth, to society. At least do the courtesy of looking us directly in the eyes and tell us why our chosen profession is not worth proper compensation. To my fellow Wyomingites: Please let these men hear from you directly about their proposed legislation. Use the following contact information and exercise your right to representation to tell them that this proposal is unacceptable. Help send the rest of the United States a clear message that we DO value education and educators. In the words of my husband, Kristopher Marriott, “Keep the masses poorly educated and they will believe anything you tell them. The uneducated and poorly educated are actually easier to control and instill fear into.” Do not let them instill fear into our hearts. WE are the people. THIS is our state. THEY represent us. I am mortified by this bill. Would you like to have your salary cut by even 1℅ let alone 20!!?? Seriously! Living in Wyoming is a blessing but also a sacrifice. Teachers bring about the next generation. My dad is a teacher in Wyoming and as a young family a cut like this would have devastated us. As a state employee I am sick to death of hearing about cuts but yet the governor’s staff got a healthy raise and there is also a bill to pass an increase for elected officials. A lot of confusion comes from strategies such as these. Please be cognizant of the impact a decision like this would have on not only our teachers and their families but the economy as a whole. In one way or another it will effect all of our families in terms of the quality of education our children will receive. Thank you for your service to our state. HB233 if passed, will completely kill the faith that all educators, and futurs educators hold in Wyoming’s local government. Without hard working educators to teach all other professions, even your government possitions would not exist. Education is a really tough field to be in and requires a lot of hours work beyond the 7:30-3:30 school days with students. Should you all spend a week in any educators life and see what is required, you will see that they do not deserve any form of a pay cut whatso ever. Does the future generations of Wyoming not deserve quality education? Are you trying to run people from the state of Wyoming? Do you truly have the Wyoming people and economy in your heart and mind? If you do, you would not give raises to other areas and cut educators salaries to cover that expenditure. You see, you are about to hurt one of the smartest, well educated, groups of people, right where it counts. Please do not make the mistake of thinking they will take this quietly. They won’t. I grew up in Wyoming, and I left to attend college where the weather is warm, and I could not travel home on the weekends. I have been away from Wyoming for 18 years now. I have three education degrees, My AA is from Western Wyoming, College, my BS is from Shorter College in Georgia, and my M.Ed is from Walden University in Curriculum, Instruction, and Assessment. I have been looking into returning home to Wyoming to live because I miss it, and my family still there. I want to leave the higher population area I live in and go home to teach. However, if HB233 is passed, I would not be able to live on the salary I would be paid there, should I be fortunate enough to be hired. I now earn more than your entry level positions, barely, even with the Master’s Degree pay. Moving home to Wyoming would be a big cut in wages already, with HB255 I could not afford to live and still pay my student loans. Are you trying to run educators out of Wyoming? Do you seriously think more would come in from out of state? You really need to look at the big picture of what will happen to the great state of Wyoming if HB233 passes. Educators teach today’s and tomorrow’s generations, and they are the future of Wyoming. Please do not even consider opening this can of worms by passing HB233, for it will begin the decomposing of the great state of Wyoming. I have been in the process of enrolling in a Masters of Special Education program. As a teacher from California who grew up in Utah, I have been around. I taught for six years in California once I moved there. I am also in the process of getting my certification transferred to Wyoming. I didn’t come here to teach; my children were too small to leave without a parent. We came for my husband’s job while I stayed home to raise our children until they were all enrolled in school. We suffered financially for this sacrifice, but I never thought I would live in Wyoming. It just never occurred to me. I would appreciate it if you and all the members of Wyoming Congress could appreciate that particular statement. People who don’t grow up in Wyoming, are not dreaming of coming here. It doesn’t even occur to them. If you want to keep your education system growing and the precious scores you find so all important to your decision to fund education, you had better keep the salaries right where they are or higher, or dozens of teachers who are not Wyoming born will just go back to those states where family lives. If they can be nearby family while they get paid just as much as (Utah) or less than other states, they will leave. They will leave if they can sell their houses. I will decline to continue to transfer my credential, because we will leave. I will not have the money to pay back the loan to pursue to further my education when I already have a valid teaching license and I will go where the educators get treated like irresponsible professionals all over this country, yet be closer to family. Consider how you replace the educators that will leave you hanging here. Consider how you entice ANYBODY not originally from this state to come here. They can find other careers or teaching jobs that pay just as much as other states. There is zero reason for them to stay in such a sparsely populated state, when they can be treated the same way in other states with much more choice in housing, shopping, entertainment, etc. I have watched my wife go without any pay raise fo 7 years now as she works for the state and over these same 7 years I have seen many within the University and legislators continue to receive raises and now you think reducing wages is the answer. Not acceptable and I don’t understand how programs that make income have to foot the bills for the university to further their programs within the sports programs ?? You all at the highest administrative level need to ale a cut or atleast a wage freeze and consider lower the expectations of the sports programs and let true education take place and also look within the programs that create funds and allow them to use their funds within their own programs to better them and not take their funds and spend it in useless places to begin with !!! We need to leave the salaries of the educators alone and start managing the wasted funds you spend not the needed wages we need to leave alone !!!! No, no, no! Do you want all of our teachers to find other jobs or leave the state to make better money for their families? What will our children do for education then? This is a bad, bad idea! I am beginning to think we as voters need to clean house and start over. It’s hard enough keeping our children and students in Wyoming. This bill will not only cause harm to our current educators but it will cause graduates to find work in other states where they can earn a decent living. Please consider the ramifications of this bill. Vote it down! This is not acceptable. Fight against HB233. Show our educators that we value the work they do. Vote this Bill down, it’s time that you stop mistreating our teachers and schools. We hold you accountable for years of irresponsible management of the budget, not our teachers or children. The only thing this Bill will accomplish is devastating our States education system and decreasing our kids ability to have a proper education. There are other ways to manage the budget, and we elected you to represent us. Do not cut teachers wages, and do not hamper our educational system. Improve our state, do not decimate our state. My daughter just started at Laramie Junior High last Fall and it would be a shame to lose yet another valuable teacher. You probably think that a PE teacher is not valuable enough, but let me tell you. My daughter has a Masters in Kinesiology and Health from the University of Wyoming and chose to stay in Wyoming and teach. Giving back to the State she loves. Although she would not have a problem finding another teaching position in another State, but shame on you for driving her out. I appeal to your sense of decency and do the right thing here and forget this bill. Roll back to the early 90’s when beginning teachers in WY could qualify for food stamps and almost every teacher was moonlighting during the school year and trying to find employment for the summer to be able to survive in Wy. Teachers were doing phone interviews with districts in other states and just wanting to find another job somewhere besides WY. Reducing Community College pay is also insane. Those jobs are some of the lowest paid in education. They use a lot of adjuncts who usually have other jobs or are looking else where. Make the pay too low and you will lose a lot of good teachers. Also keep in mind that WY has one 4 year University and it has strengths BUT if you gut all revenue you will have a failing school. To Scot Clem and Ogden Driskell. The college in Gillette has been really good for Gillette. Educate yourselves before you decide that teachers are over paid and deserve a 20 percent pay cut or that young just out of schoolteachers will be rushing here for some of the lowest salaries in the nation. What the hell?! Let’s just devalue our state more. Keep it up and no one will stay or come to Wyoming……or maybe that’s your plan? Vote this down and these men out!! I am so disappointed in our state government that it is hard to express myself. I have been teaching in Wyoming for 9 years, have my master’s degree, and love my job. However, if this bill passes my salary will be reduced to less than what I was making 10 years ago as a first year teacher with a Bachelor’s degree. This is not just affecting the teachers and our living, but our students. If this passes this state will not be able to hire, or retain highly educated (above a bachelor’s degree) or experienced teachers. The only ones that will take jobs will be first year teachers looking to get their feet wet, and then move on to other opportunities in other states. The cost in training alone is going to skyrocket above what the decrease in salaries will cost the state. Any business person can tell you (the state representatives) that turnover in any business is one of, if not the most expensive cost to a business. I am also ashamed that these representatives deem the teachers of this state so lowly that they would even consider doing something like this. I would like to pose a couple of questions to you: Have you taken a 20% pay cut in your salaries to help cut state spending? If not, why haven’t you volunteered to cut your pay instead of that of the people who are really making a difference in this state? Teachers pay out a lot to get an education to qualify us for our position. We have ongoing training to meet state requirements for recertification, and pay out of our pockets to recertify every 5 years. We do this because we love our students and believe in what we do as teachers. Most of us have thousands upon thousands in student loans that we are paying on for our entire lives just to become a teacher. It is bad enough that we have not had raises (other than the 2.5% the state gave all government employees a couple years ago), while cost of living continues to go up, but to expect us to just sit back and let you cut 20% of our income from us is ludicrous. Coming from Sweetwater school district #1 where my children are in school and from Natrona County where I graduated from and my parent still teaches. We need great educators for our children. People who want to be in this area and people who can focus positive energy on being in the classroom. 20% is a large amount of income. In what other business setting would you make that kind of a cut without sad repercussions?! Wyoming can’t become a ‘last option’ state for education graduates. Let’s find a different solution to make budget balance… change the lodging tax, or energy tax or diversify the 20% cut throughout other areas. But to take 20%!! From individuals who are helping shape the future is a disservice to our communities! Please support our teachers by NOT supporting this bill. Apparently tonia doesn’t teach math. She claims she dedicates 65% to teaching, 35% to research, and 10% to service. That’s 110%. What she really should do is compare teachers’ salaries to others with the same level of education and at the same point in their careers in other professions. What does a rookie manager with a BA in Business earn in Wyoming? Compare that with the example she employed in her statement. Her own screed gives many reasons for reducing wages. Certain industries have suffered economic downturns. People are moving from the State. Both of these result in lower tax revenues from sales and property taxes. Since public schools get their revenues from these taxes their revenue streams are also drying up. This bill, as tough of a pill as it is to swallow, helps districts in the long run. By forcing districts to maintain the “teacher-friendly” wages under greater financial duress forces those districts to issue general obligation bonds, basically whipping out the credit cards to pay teachers. This bill gives them breathing room to avoid increasing their debt load. Government workers have to realize that there are limits to the money coming in from the public. Private citizens have had to swallow the bitter pill of seeing their own incomes reduced. Now it is government employees turn to feel the pain. As hard as most teachers work they deserve good pay and their helpers who carry out their lesson plans also deserve to be paid a decent salary which they don’t at this time. It’s a crying shame what they are paid, especially since most of their helpers, aka para professionals, are certified teachers who are para’s because they love the profession and haven’t been able to secure a job themselves. I’m totally for higher pay and good benefits for teachers and para-professionals. I will say right now that you couldn’t pay me enough to teach other people’s kids in this day and age. The things our teachers have to deal with on a daily basis are ridicilous. It is bad enough that state and uw employees never see even cost if living raises. To actually cut teacher salaries is not only a diservice. It’s a disgrace. I will definitely contact those listed above and tell them how absurd this is! Sorry for the typos, speaking of education. I meant ridiculous, and cost of living. Also, what tonya says about housing market and businesses closing up us real. We are already seeing it. This us due to lack if raises, downsizing and budget cuts at uw, city and state. Wake up people. If they continue Laramie and other smaller towns will dry up. As many of my colleagues in our school district, I agree to “wear two hats” when was asked, and now teach all ESL classes in both middle and high schools. We didn’t get a raise, didn’t ask for that because understand the hardship in our home state economy. But last week our Representative Miller’s proposal – HB 233 – shook the state and we realized that we might lose even what we have now! This is outrageous! 20%??? Do you know what would happen to the families of these teachers? Do you realize how many people would be adversely affected by this cut? I cannot stress enough how wrong I believe this cut would be. This is a good way to drive people from the state who value education! Not only the teachers would have to leave, but families who want their children to get a good education would follow! This proposal would dim our future prospects, & keep future prospective educators from considering Wyoming as a good place to live. I concur with Tonia Dousay and others who reveal the dire consequences of legislation that reduces teacher pay at a time when the economy is tested and can benefit from increased cash flow to all segments of the marketplace. This recently introduced bill has negative ramifications for today and the future. Please reconsider what you have proposed, and retract this bill — or vote it down. You people who wrote this bill need to step into the classrooms for a while. I’m certain your minds will be changed and you will be seeking a way to find them better compensation rather than cutting teachers wages. Surely there is a way to cut the budget without expecting our educators to work for poverty wages. This is a disgusting! Why would you want.ro cut teachers pay they don’t make enough as it is. Please vote against it.